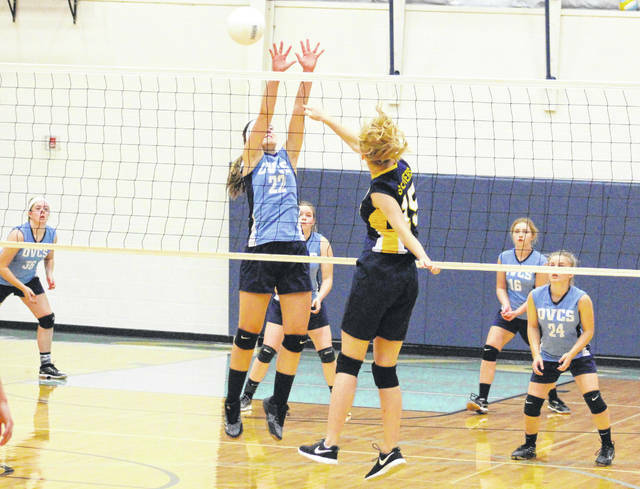 Ohio Valley Christian sophomore Laura Young (22) goes up for a block attempt during Game 3 of Tuesday night’s non-conference volleyball match against Grace Christian in Gallipolis, Ohio. GALLIPOLIS, Ohio — These soldiers marched in a straight line. 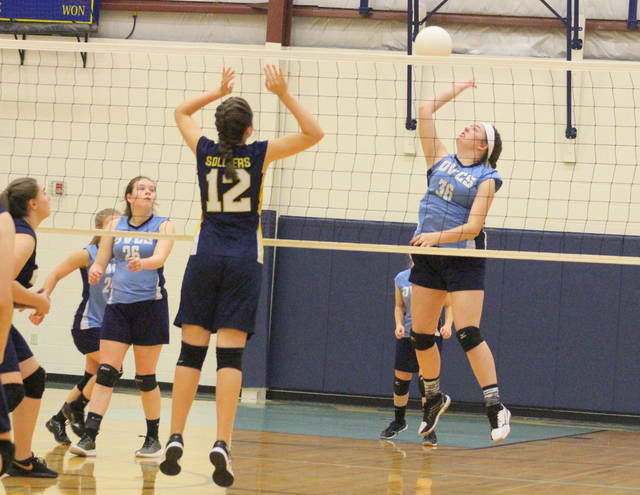 The Ohio Valley Christian volleyball team put up a spirited fight in the middle game, but visiting Grace Christian ultimately had too much firepower during a 25-16, 25-22, 25-11 decision on Tuesday night in a non-conference match in the Old French City. The Lady Defenders (6-9) never led in either the opener or the final game, but the hosts did manage to keep things quite interesting in Game 2 as both programs fought back and forth through 11 ties and six lead changes. The Lady Soldiers, however, broke a 20-all tie with three consecutive points, then both teams took turns scoring two straight points before reaching the final three-point margin. 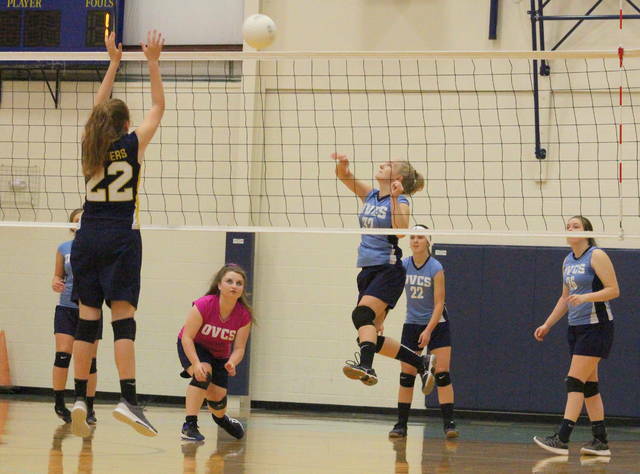 Ohio Valley Christian forced ties at three and again at eight during the start of Game 3, but Grace broke serve and then reeled off 14 consecutive points on serves from Shay Cicenas — giving the guests a 23-8 cushion. The hosts answered with three straight points to close to within a dozen points, but the Lady Soldiers picked up the last two points to wrap up the straight-game decision. OVCS tied Game 1 at one before falling behind by 17 points at 23-6, but the hosts rallied back with an 8-1 run to close to within eight at 24-16. Emily Childers led the Lady Defender service attack with eight points and four aces, followed by Makala Sizemore and Chasity Deckard with four points apiece. Chloe Payne was next with three points, with Laura Young and Lauren Ragan respectively adding two points and one point. Payne led the hosts with five kills and Young added four kills and a team-best three blocks. 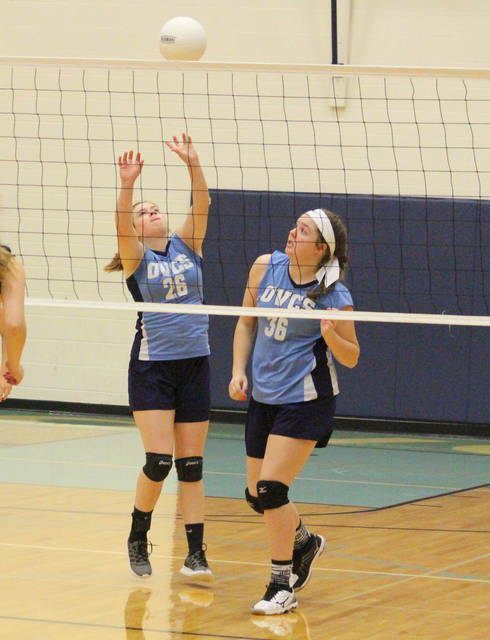 Childers, Deckard, Ragan, Sizemore and Marcie Kessinger also had a kill apiece. Payne also recorded two blocks in the setback. Kessinger posted a team-high eight digs for OVCS. Ragan dished five assists and Sizemore added four assists. Cicenas led Grace with 20 service points, followed by Morgan Maynard with seven points and Rachel Tanner with six points. Samantha Wells and Mackenzi Pyle added four points apiece, with Hannah Benge and Anne Brewer respectively adding three and two points. Tanner led the visiting net attack with six kills, with Wells and Pyle each adding three kills. Pyle also recorded the team’s lone block. OVCS returns to action Thursday when it hosts Covenant at 6 p.m.